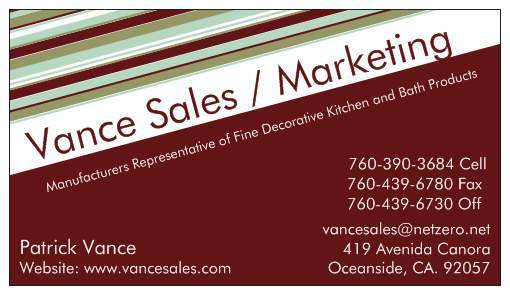 The Vance Sales Team would like to hear from you. Have questions about any of the manufacturers we Represent? Any questions about a product within the different products we Represent? Need to know where you can see the product on display? Need to know techincal Information? Designers looking for unique and hard to find items? The Vance Sales Team is here for you! Southern California, Arizona, Las Vegas and Hawaii. We focus maily of the High-End Kitchen and Plumbing Showrooms, Plumbing Wholesalers, Designers and Architects. simply provide your e-mail information for a speedy reply.